Tablets are useful devices, but some are limited by their operating system. That isn’t the case with Windows however as today’s slates can hang with laptops. If you’re looking for the best Windows tablet, you’ve come to the right place. After careful consideration, our experts picked through dozens of tablets to find the top options that run Windows. We’ve included a price point for everyone along with a buying guide to help you find the perfect choice. Most tablets in this range sport QHD or FHD displays although the former will give you more battery life – something to keep in mind. If you game or plan to use your tablet for modeling or artwork, you may want to learn a bit more about resolution. All our choices are convertible as well, which means you need to consider the build quality, color depth and sensitivity of the display if you plan on using a stylus. If you’re looking for the best 2-in-1 laptops, it’s always a wise idea to check out the keyboard beforehand. The same rule applies here as many machines have similar specifications so little things can make a huge difference. Aluminum is obviously your best option if you want durability, but plastic tablets are cheaper and can still take a beating if built well. With the display, Gorilla Glass will be your best friend but is no substitute for a good screen protector. Most tablets stick to two standard sizes with slates around 8-inches and ones that clock in around 10. That rule applies to devices running Android, iOS, and Windows, and there are 12-inch slates available as well. While iOS and Android tablets stick to that formula for the most part, the best Windows tablet may buck that trend. It’s not uncommon to find a Windows tablet in the 10 or 12-inch class, but you can go larger. There are a handful of 15-inch slates which blur the lines between portable PC and tablet, just like phablets did with smartphones years ago. If you do go big, keep the battery life in mind as more pixels require more power. As we’re dealing with tech that runs Windows, every tablet on our list will have a processor from AMD or Intel. To keep things simple, if you want the fastest processor, look for an 8th generation chip from Intel. AMD does have comparable options, but they aren’t as prevalent in this range. A laptop with an Intel Core i7 will absolutely fly, especially if you’ve got an ample amount of RAM under the hood. We recommend at least 4GB of memory at a minimum although you can get by with less if you only plan to browse the web or use light-duty applications. The other type of power you need to think about is battery life. A large QHD panel will draw more juice than an 8-inch display, but so will games and certain applications. How you use your tablet plays a large part with battery life although 8-hours is around the average in most cases. Hard drives usually get their own section in a tablet buying guide, but Windows-based slates use solid-state drives which are speedy and efficient. They usually have microSD card slots and at least one USB port, which allows you to expand when things get tight. That said, 256GB is the minimum amount of storage we would recommend. You can get by with 128GB but will need a USB stick or memory card sooner than later. The last thing we want to touch on is accessories. Convertible tablets are still considered 2-in-1’s if they have a stand built-in, but a keyboard is what you’ll want for true productivity. Some models will include one out of the box, and the same goes for an active stylus. 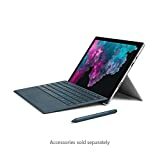 Both of these items can set you back a considerable amount of coin when purchased separately, so the “extras” are a bit more important in the tablet world than with other mobile gadgets. With a sleek design that leaves everyone in awe, the Surface Pro 6 from Microsoft is one of the best Windows tablets on the market! This is due to the configuration it features (8th Generation Intel Core i7 processor, 16GB RAM, 1TB SSD storage space) and the gorgeous touchscreen (12.3” PixelSense display) that’s worth the rather hefty price (especially since the basic accessories aren’t included). 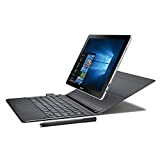 If you decide to purchase the Signature Type cover with keyboard, you’ll have a 3-in-1 device that can be used as a laptop, a tablet, or studio device for sketching and drawing. Moreover, with or without the cover, Surface Pro 6 is easy to carry wherever you go. As such, you can use it in business presentations, for work while on commute, or to browse and keep up with social media. Its versatility doesn’t know limits! The tablet comes with Windows 10 Home, one of the most popular operating systems on the market. This allows most users to transfer their work in a familiar environment with impressive features such as Hello Sign-in, Office 365, or Cortana as your virtual assistant. Samsung was producing tablets long before our top option became popular, but they recently expanded their lineup to include slates geared towards Pros. The Galaxy Book is one of them, and it has several flagship features to go along with an outstanding display. Sammy is known for their AMOLED panels, and this one certainly pops. This particular variant has a 12-inch Super AMOLED display with HDR capabilities and a resolution of 2,160 x 1,440. Beneath that slab of glass, you’ll find an Intel Core i5, 4GB of RAM, and a 128GB solid-state drive. You’ll be thankful for that panel once you pull out the S Pen. It’s the perfect accessory for this 2-in-1 and comes included along with a keyboard cover. Other features of interest include a USB Type-C port, a 13MP rear camera, adaptive fast charging, and a microSD slot. While we think the Samsung Galaxy Book SM-W7220NZKBXAR offers up the best value, there are 10.6-inch variants available as well. You can also go with a larger SSD or bundle which includes the Staedtler Pencil, an excellent accessory for artists. Microsoft has more than one type of Surface Book, and this one is more akin to a laptop than a traditional tablet. 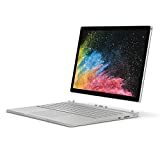 The Surface Book 2 is still portable although you may need a larger bag to lug this one around. Whether you go with the 15 or 13.5-inch version of the Surface Book 2, you’ll have plenty of horsepower. Our top option has a whopping 16GB of RAM and the 8th generation Core i7. It also has more storage than most with a 512GB SSD, and you can bump that up to a full terabyte if you need more space and don’t dig portable storage solutions. Microsoft used the same PixelSense tech on this machine, so that panel is sharp, vivid and words with an active stylus. The display clocks in at 3,000 x 2,000 which makes it an ideal gaming tablet when you factor in the GTX 1050 under the hood. The cameras are sufficient, but not anything to write home about an on par with other tablets in this range. Whether you choose the Core i7 with a 1TB hard drive or the 15-inch beast, the Surface Book 2 is a great slate for games. We also like the fact its Windows Hello ready thanks to the IR camera system in the front. This tablet features an Intel Quad-Core Atom x5-Z8350 (running at 1.44 GHz) processor, 4GB DDR3L SDRAM, and has 64 GB eMMC SSD storage space. Besides the powerful configuration, it also comes with a cool-looking dock that features an ergonomic keyboard, multi-touch touchpad, and additional ports. This makes it a 2-in-1 device, that can be either a laptop or a tablet, according to your needs. Moreover, it can be used with the pen from the same series, that works great with the 10.1″ LCD WXGA touchscreen. 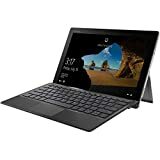 The tablet can be used for various work projects, conference calls (due to the built-in webcam), or entertainment (the screen is supported by Intel HD graphics and features a 1280×800 pixels resolution). Equipped with Windows 10 Professional 64-bit version, the Acer Switch 10 is a fantastic tablet to have around! It’s extremely easy to keep up to date with the world’s news due to the wireless LAN IEEE 802.11ac and Bluetooth 4.1 connectivity options, and it’s powerful enough to handle most demanding tasks. If you’re looking for a cheaper version of the Surface Pro 6, the Lenovo Miix 520 might be the right choice. With a similar design (docking keyboard and kickstand), the tablet features an aluminum alloy body and an ultra-thin design. On the inside, it’s powered by an 8th Generation Intel Core i5-8250U Quad-core processor that runs from 1.6 GHz – 3.4 GHz, 4GB DDR4 RAM and one 128GB Solid State Drive for storage. It also has WiFi, Bluetooth, and a USB-C port (which is missing from Microsoft’s tablet). The 12.2-inch Full HD IPS touchscreen display is supported by UHD Graphics 620 graphics and features a 1920 x 1200 pixels resolution. You also get two built-in cameras: a 5MP front one (for video calls or Instagram Live sessions) and an 8MP rear one (for pictures and videos), a keyboard and pen. To makes things easier for users, the Miix 520 comes with a fingerprint reader and Windows Hello for a quick login without a password. While it may not have the same kick as the Surface Pro, the Lenovo Miix 520 is a nice replacement if you don’t want to spend that much on a 2-in-1 tablet.